The cornea and sclera form the outer fibrous layer of the eye. The cornea is a clear transparent tissue, which is located forward of the eyeball. 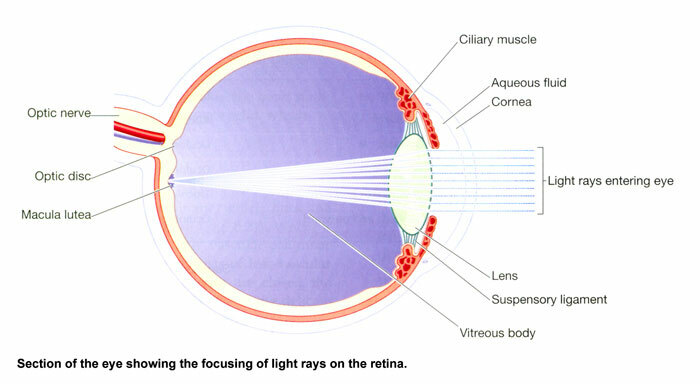 Light rays pass through this limpid tissue, and on through the crystalline lens to reach the retina. The cornea is convex in shape and for this reason directs or bends light rays so that they can be focused on the retina. The cornea also provides protection to the globe. Between the cornea and the crystalline lens is a space which is divided into two areas, the anterior chamber and the posterior chamber. These areas are located either side of the iris. Both the anterior and the posterior chambers contain aqueous fluid. The cornea and the crystalline lens have no blood supply, so this clear aqueous fluid provides nutrients and removes any waste deposits from the transparent structures in the front of the eye. The Iris is located behind the cornea and in front of the crystalline lens. The Iris divides the space behind the cornea into the anterior and posterior chamber, which contains aqueous fluid. The Iris is a coloured tissue which extends from the ciliary body and is apparent at all times. The colour of the Iris is determined genetically. The purpose of the Iris is to constrict or enlarge the aperture of the pupil. By doing this it determines the amount of light that enters the pupil. In bright light the muscles of the Iris constrict the amount of light entering the pupil, and in low light the muscles enlarge the pupil to allow more light to enter. 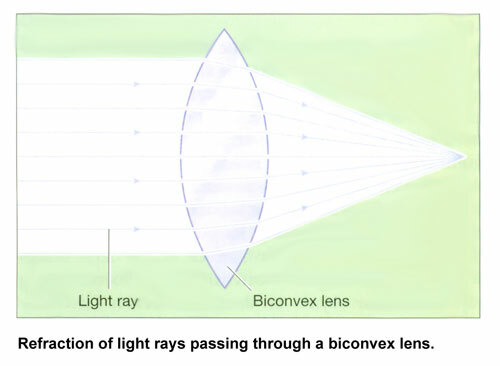 Directly behind the pupil is a highly adaptable circular bi-convex transparent body called the crystalline lens. 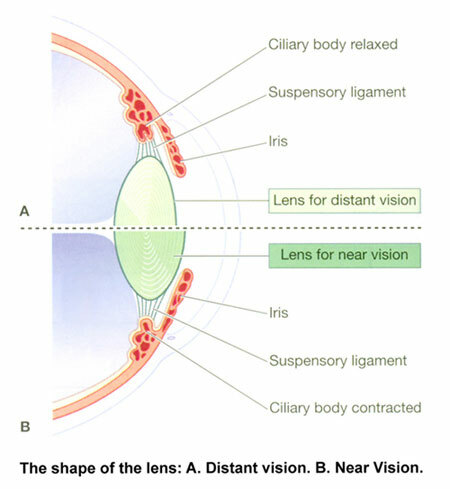 This lens is dependent on the ciliary body and the suspensory ligaments to change its thickness so that it can vary its refractive power accordingly. When the ciliary muscle pulls on the lens it decreases its thickness, allowing objects in the distance to become clear and in focus light on the retina. when it releases it’s pull, it increases in thickness for near objects to come into focus on the retina. The eye consists of three layers of tissue which make up the wall of the eye. The sclera is the outermost layer of tissue, also called the white of the eye. This layer is a very stable fibrous membrane that continues to retain the shape of the eye and provides protection. Connected to the sclera are the extra-ocular or extrinsic muscles of the eye. The choroid is a dark brown vascular coat of the eye between the sclera and the retina. When light penetrates the pupil and focuses on the retina, nerve endings are triggered and then absorbed by the choroid. 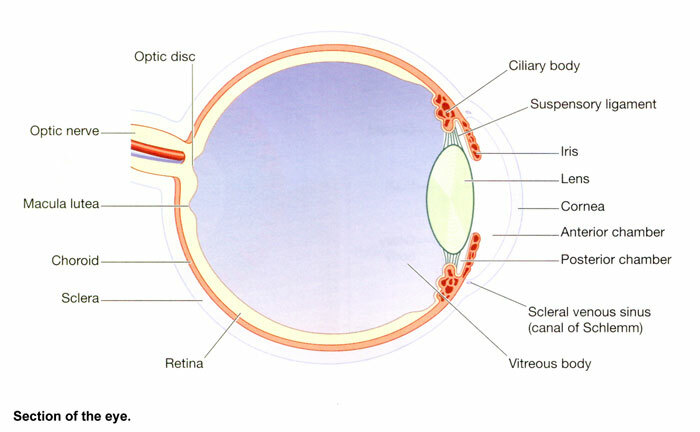 The retina is a delicate, multilayer, light sensitive membrane lining the inner eyeball. 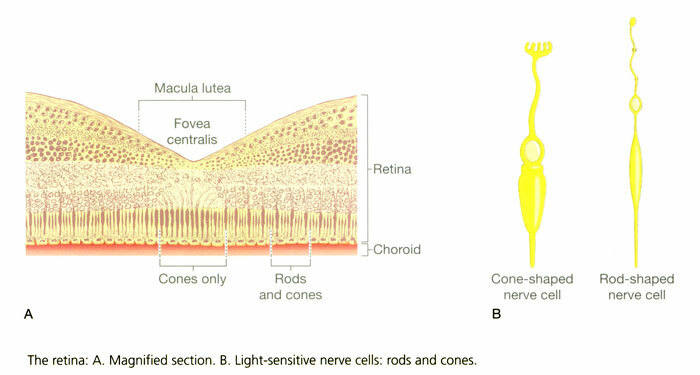 The layer highly sensitive to light is the layer of rods and cones, when light hits the retina photosensitive pigments within the rods and cones convert light rays into nerve impulses. The retina covers about three-quarters of the inner surface of the eyeball, this layer lies between the choroid and the vitreous. 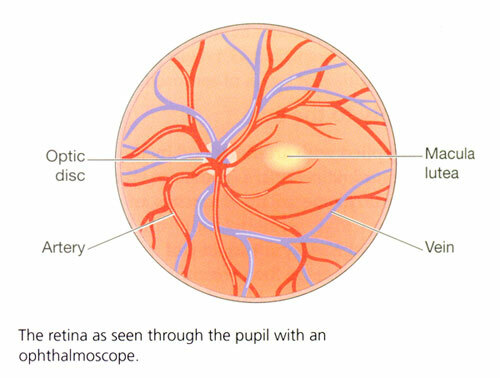 Towards the posterior part of the retina is the macula lutea which is the most responsive part of this layer. Where the optic nerve leaves the eye, there is a blind spot in the vision, this part, known as the optic disc has no light-sensitive cells. The vitreous body is a soft, limpid consistency made up of about 99% water, it occupies the cavity behind the crystalline lens whilst giving an appropriate intraocular pressure to avoid the walls of the eyeball from collapsing. The Vitreous body and the aqueous fluid maintain the shape of the eye due to the intraocular pressure. The optic nerve is a motor nerve that connects the retina of the eye with the brain. 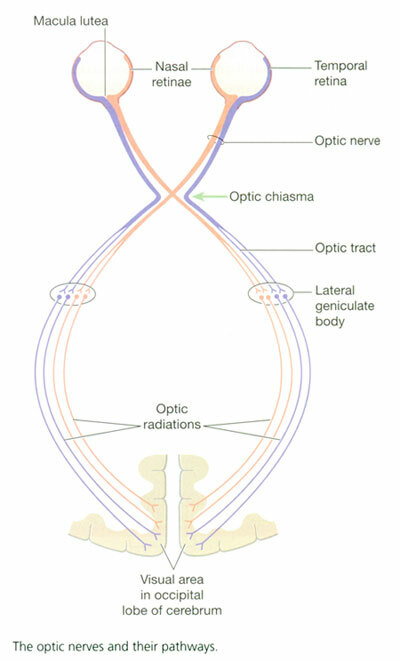 This nerve penetrates the choroid and the sclera from the rear of the eye at the optic disc where it is met with the other optic nerve to form the optic chiasma. This is an X shaped structure formed by the two optic nerves when they cross each other on the undersurface of the brain. The optic nerve sends all information from the retina to the brain to give us a picture.